SSR LLC – Lyondell M&A: Triangulating To The Best Idea – WLK? Lyondell M&A: Triangulating To The Best Idea – WLK? LYB’s suggestion at its recent investor day that acquisitions are on the table likely has some existing holders rattled. 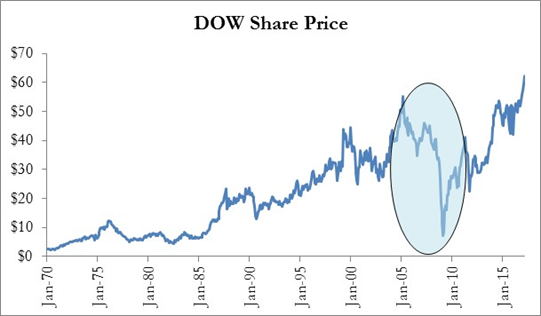 Generally, they own the stock for the consistent return of cash to shareholders through dividends and buybacks and for the leverage to the ethylene cycle. LYB has run out of easy growth; from improving the productivity of the asset base and exploiting some low-cost expansion opportunities; driving increased ethylene capacity in the US much more cheaply and much more quickly than the new-builds. The company is considering new builds – polyethylene and PO/TBA, where the returns will be lower, and less clear because of construction cost and timing uncertainty. It is very appropriate for the company to look at acquisitions at this stage in its evolution, particularly if they can add capacity at less than the cost of new construction. Cash flows are immediate, and if LYB can find something to buy that provides synergies and manufacturing improvement opportunities this is likely to be a much better use of cash than building new capacity. May not be better than share buyback and dividend increases, depending on the deal. With the guidance that the company has given with respect to deal size, business type, synergies expected, accretion and return on investment, we see WLK as an obvious candidate for LYB. Consolidating US ethylene is a tactically smarter move than simply adding to capacity. LYB has ethylene surplus in the US and Europe – WLK needs it in both locations. Adds another product line to LYB (the chlorine to PVC chain) but sticks to commodities. WLK is more expensive than LYB today – everyone is (except perhaps EMN – see recent research) – Exhibit 1, but we think an accretive deal can probably be done at a price that works for WLK. We can get to an IRR greater than 12% with LYB paying $100 per share for WLK assuming a half stock half cash deal – the IRR is below 10% if it is all cash at that price. We remain positive on both LYB and WLK because of our view on ethylene. 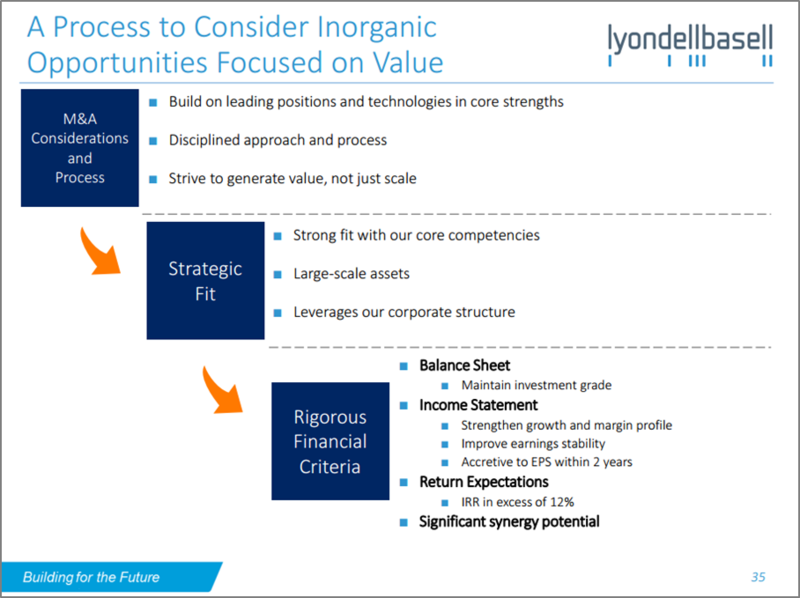 At its investor day on Wednesday, Lyondell started talking about more limited share buybacks and possible large acquisitions. The immediate share price reaction was negative, which should not be a surprise given that the strategy for years has been one of returning cash to shareholders and most LYB holders are looking for straightforward leverage to the ethylene cycle with that leverage increasing each year as the share count falls. M&A on a large scale would be a departure from a strategy that worked well for several years, but has seen the equity value of the company fall through this recent period of ethylene supply/demand imbalance uncertainty. This despite continued very strong earnings. Investors have been generally supportive of consolidation moves in the industry thus far giving, DOW, DD, PPG, PX, Linde, Akzo, and others the benefit of the doubt with regard to announced M&A, but this is likely not going to be the case with LYB unless the right deal and right deal structure is announced. Most of the large M&A we have seen recently is in stable high margin businesses where industry growth is slowing and consolidation, which drives synergies, is seen as a positive path to future growth. LYB is in highly cyclical commodity businesses and while we may have become comfortable with more stable cash flows over the last few years for LYB and the industry, there have been plenty of major cyclical collapses in this sub segment of the industry in the past and some very poorly timed acquisition moves that have come just ahead of margin collapses – LYB, DOW, HUN, and others have made acquisition moves in the past that have almost resulted in bankruptcy because of cash purchases at an industry peak or mid-cycle that were subsequently followed by a margin collapse. While consensus, and SSR, believe in a more stable ethylene market because of the shale advantage, no one could see much wrong with the DOW/Rohm and Haas deal when it was announced! A major reason why we, and others, like the DOW/DD deal is because of the merger and the more limited price risk – no one is putting up cash. The same appears to be true for PX/Linde. But let’s not write off LYB quite yet and instead look at what the company said (precisely) on Wednesday, as there is plenty of room for upside if they stick to the script. First – but probably most important – is the change in the compensation structure for as many as 75 senior employees from 2017. Prior to 2017, return on assets was a key driver – this made sense as the focus was on driving productivity and sweating the asset base that the company already had. With 95% operating rates across the board and cheap expansions behind them, the company has changed the comp structure such that it is now driven by total shareholder returns – dividend plus share price appreciation. Consequently, this team needs the share price to go up and go up meaningfully over the next five years if they are going to get a decent payday. A poorly timed, expensive, all cash, off-piste, large acquisition brings extensive risk to the company – especially in a volatile crude oil world. A move that sends the stock down 50-60% or more (see Exhibit 2) could be unrecoverable for management over the life of the new comp scheme. We are assuming that this team is not that crazy and recognizes that energy prices are out of its control and the major wild card in any higher-risk cash dominated deal. Again, if we take LYB at its word and look at the criteria that the company sets out regarding what fits and what does not fit from an acquisition perspective – i.e. if we reference the Company’s own slide – Exhibit 3, the field is narrowed considerably, by defining what will work and what won’t. We would assume that LYB is focusing on the US, given the feedstock advantage – any non-US acquisition would likely not sit well with investors unless they were companies or assets also placed with advantaged feedstocks, such as Nova or Borealis – both privately held. Targets could include the basic chemicals businesses of oil companies, such as Oxy or Total, or even Shell, though we see Shell as a buyer rather than a seller if it is serious about the Marcellus project. CP Chem – too big and the partners would probably not sell – also run very well so not much to do on return on assets. HUN (post TiO2 spin) – fits with polyurethanes and advanced materials but too small – reasonable synergies and probably production improvement possibilities. 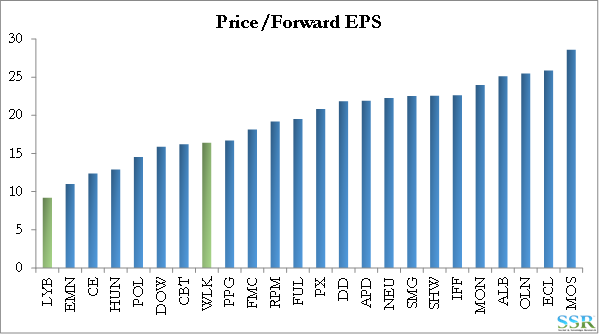 TSE – too small – very focused in styrenics – very biased towards Europe with no feedstock edge. Some synergies but not much. Oxychem – new business line for LYB so limited synergies – LYB large seller of ethylene to Oxy already so would secure ethylene demand. WLK – right size, right businesses – adds a product line but has ethylene, polyethylene and styrene. Significant synergies and no secret that the old Axiall assets can be run better. Some integration opportunities with Vinnolit in Europe. Maybe synergies with PP compounding and PVC compounding businesses. LYB has some further low-cost ethylene expansions in the US – WLK needs ethylene in the US even with the Lotte venture. Williams ethylene business – available but makes no sense to anyone without ethylene demand – LYB is already a net seller of ethylene. Nova, Borealis or both – scale and synergies are there but unlikely that the owner is a seller – maybe too big. While WLK may seem the more logical target to us, there are plenty of other acquisitions that LYB could be looking at. However, WLK does tick many of the boxes and is the right size – LYB may have to pay close to $16-17bn to get it (including net debt), and at that price LYB would have to sharpen its pencils on synergies and potential productivity gains, but the math could work. We show some very rough numbers in Exhibits 4 and 5 and clearly the math would work better if WLK could be persuaded to take a mix of stock and cash – LYB could pay more. You get the cash flow now – not in 4 years. The replacement value of the WLK assets is well over $20bn, not that you would necessarily want to build the assets in their current configuration – Exhibit 6. Integration benefits LYB ethylene surpluses in the US and Europe – WLK deficits. Consolidation in US ethylene rather than adding to the US surplus. Certainty – new build carries execution risk, timing, cost etc., and you take a forward risk on the commodity markets which have proven almost impossible to predict 5 years forward.